If you’re growing tired of this cold and wintery weather, brighten up your day and outfit with this Spring-inspired daisy ring. Made with Swarovski elements , its unbelievable that this statement piece is now only £9 – originally £49.95! 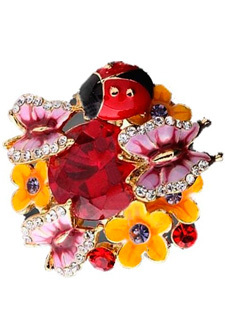 Arranged like a bouquet, a bright ruby gem takes centre stage with ladybirds, butterflies and flowers scattered around it. The ring band is adjustable too so there are no worries about it fitting! Offer ends soon – grab this beauty while you can!